Reconnect on Reboot and Setup Unattended access. 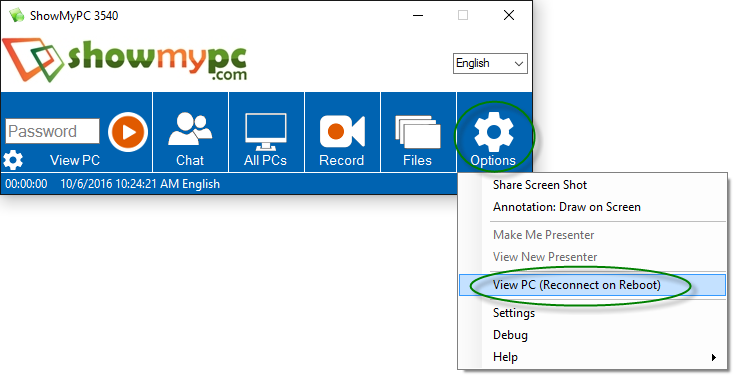 ShowMyPC provides a feature in its application "Reconnect on Reboot". 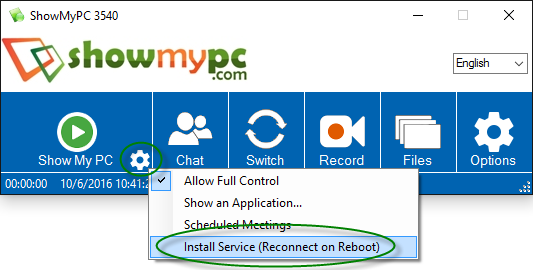 This feature helps you in a support session if you want to reboot a remote PC and reconnect back. Any time during a support session you may switch to Reboot on Reconnect, this will also work well with Windows UAC prompts. How to use Reconnect on Reboot? 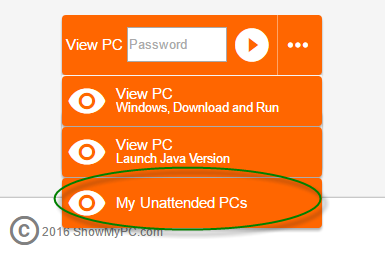 2) Enter a password and click "Install Service on this PC" . Save this password, it will be required to connect for using this installed service. You can set option to auto expire this service using the Auto Stop feature if required. 3) If you are installing the service while you are connected remotely, you will be prompted to disconnect. You should disconnect and follow the steps below to connect back using Installed Service. 1) Click on Options > View PC (Reconnect on Reboot). 2) Select your PC from the list, enter password and connect.